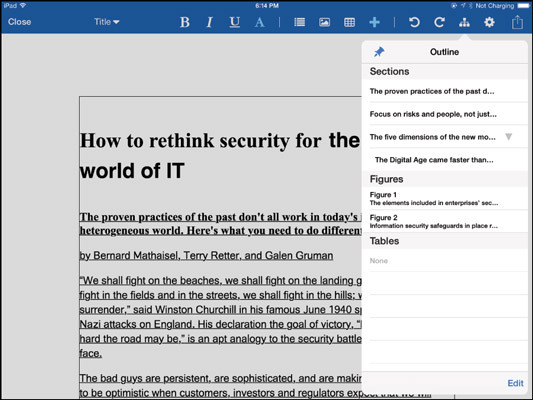 UX Write Professional offers the business user many options for storing and working with work documents on the iPad. It’s a great tool that gives you increased functionality over the native iPad apps. Tap the Settings button (the gear icon) at the right side of the menu bar; then tap Find & Replace in the pop-over that appears. Enter the search term in the Find field. If you want to replace that text with something else, enter the replacement text in the Replace field. Optionally, set the Case Sensitive switch to On to find only text whose capitalization matches what you entered in the Find field. Likewise, set the Regular Expression switch to On if you want to search for text patterns. Tap OK to begin the search. The first occurrence is highlighted in your document. Tap the Forward button (the right–facing triangle) to move to the next occurrence of the term, or the Back button (the left-facing triangle) to move to the previous occurrence. Tap replace to replace the found term with the replacement you specified previously. Tap Done when you’re done searching. Image: Inserts an image from the Photos app or from the current storage location (so that you can insert image files that aren’t on your iPad!). You have options to change the image’s width and to assign both an automatic figure number and a caption to the image. You can’t do those things in Pages, Docs, or Word. Table: Inserts an empty table with the number of rows and columns that you specify. As with images, you can set the table’s width and assign both an automatic table number and a caption to it. Insert: Opens a pop-over from which you can insert a web link (hyperlink), cross-reference, footnote, end note, table of contents, figures list, or tables list — these are particularly useful in academic and government documents. Another neat feature in UX Write Pro is the outline feature, which you access from the Outline button in the menu bar (the icon looks like an org chart). The top-level paragraphs (Heading 1) are shown; tap the disclosure triangle to see any subsections (Heading 2, Heading 3, and so on). Tap any section to jump to it. To move a section, tap Edit and then drag a section’s move handle (the icon of three lines). To delete an entire section, tap the red icon. (To work with a subsection, tap the disclosure triangle next to a main section to see its subsections. No triangle means no subsections.) Tap Done when you’re done. There are a few final areas of UX Write Pro you should know: the Share options and the Settings options, both of which are available in the menu bar through the standard iOS icons. The gear is for Settings and the square with the up arrow is for Share. The Share pop-over has four basic options: Print, Create PDF, Email, and Open In. These options do the standard things that they do in any iPad app. Manage Subscriptions: If you are paying $1 per month for the Pro features, this is where you can see when your current subscription ends as well as renew your subscription. Find & Replace: Lets you find and optionally replace text. Spell Check: Launches the spell checker. After you tap it, all suspect words are highlighted in your document. You navigate them the same way you do a search, using the Back and Forward keys. Tap Replace to either change the highlighted text or, if it’s correct, add the term to the dictionary so that UX Write doesn’t flag it again. Tap Done in the menu bar when done. Word Count: Shows the character, word, and paragraph counts for the current document. Styles: Opens the same screen as tapping Edit Styles in the Formatting pop-over. Page Layout: Lets you set line spacing, how paragraphs are separated (first-line indent or space between), page size, and margins for the current document. Language: Sets the language for spell-checking for the current document. Heading Numbering: If this switch is on, headings are automatically numbered academic style. Look & Feel: Lets you set the text size, color scheme, and keyboard color for the app’s user interface. Language: Lets you set the default language for UX Write Pro, for any document that doesn’t have a different language set in the previous Language option. Auto Correct: Lets you turn on auto-correction for when you type, as well as specific automatic text substitutions as you type and customize the dictionary used for auto-correction. Typesetting: Affects how your document is printed and converted to PDF. WebKit is the default option, but its creators are slowly adding support for a widely used academic format called LaTeX that allows for more precise renderings.